The title of this article is derived from Ephesians 1:4 where Paul describes for the Ephesians the incomparable grace and mercy shown to those who believe and are the election of God. 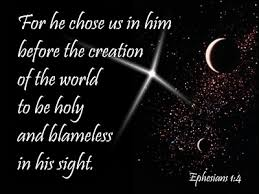 He chose us, Paul says, to the praise of His glorious grace. “In love, he chose us to adoption as sons through Jesus Christ our Lord” he continues. Nothing unclear about that! Paul clearly and unmistakably declares that God in his sovereign will and for his good pleasure chose us to be adopted in Christ and to be the recipient of all the blessings that come with that sonship. This Paul does in order to make it clear that it is not because we have done anything worthy of salvation that we have been chosen. He will continue that thought in chapter two where, after telling the Ephesians that they were dead in trespasses and sins in verse one, goes on to tell them that it is not of ourselves, or our works, that we have received salvation. The obvious question which needs to be asked in light of such clear teaching of scripture is, why then does God go through all the trouble of offering the gospel to those whom he has not chosen? If God has already chosen some to be saved and has passed the others over, then for him to offer salvation to people he did not choose seems like a cruel joke. Furthermore, if God by his sovereign will decided to choose a certain group to be saved—and here the unstated implication is that God somehow saves people against their wills—then why doesn’t he just save everyone? This was one of the late author Dave Hunt’s more common objections to the doctrine of election since, in his view, for God to choose some and allow others to perish was for him to be capricious and malevolent. What these objections ignore is the fact that those who believe that man has the ultimate say in whether he is saved acknowledge that God has exhaustive knowledge of all future events. Thus, God knew from all eternity who would be saved and who would not. Aside from the question of how God has such knowledge, that then becomes the basis to ask the same question about the offering of the gospel by the free will side. If God knew who was going to be saved before they were even born, then why bother offering the gospel to that group who would not believe? The Arminian side has the same difficulties in answering that question. But the doctrines of grace teach us that God has a purpose for everything. Something that cannot be said if God is simply reacting to man’s free will. Thus, the fact that some are saved and some are lost is because God has so willed it in his infinite purpose. We may not understand it, but we can submit to his will as he has revealed it. Why doesn’t God choose to save everyone? Why indeed. Again, the answer is found in the fact that God has his purposes and, human, frail and finite as we are, it is impossible for us to fully understand what those purposes are. To be sure, some find the fact that God will punish those who are disobedient distasteful. They will then invent the universalistic theory of salvation whereby everyone in the end will be saved. We cannot do away with what the Bible clearly teaches simply because it is difficult to come to grips with. The atheist often complains about final punishment and uses that doctrine to “prove” that there cannot be a god, especially the God of the Bible. The fact that they do not like the doctrine does not make it false. In the final analysis, we cannot comprehend the inscrutable purposes of God (Romans 11:33-36). It would take an infinite mind to comprehend another. That is not offered as an excuse, but simply as a statement that we cannot seek to answer the unanswerable. Suffice it for us to accept what God has said about himself, about his creation and about his election.